[Video] What Does the Sloth Say? You’re gonna wanna sit down for this. Butterflies feed on lots of different plants, but each species need a particular plant or group of plants on which to lay their eggs. Monarch butterflies need Milkweed (Asclepias species) for reproduction, and these lovely indigenous flowers are in decline – between agricultural practices, roadside chemical sprays, and everything else that puts native species in decline, milkweed species, like many other plants that support native wildlife, are in trouble. I wanted to take just a quick minute to assemble some resources and links that will help you gather all the necessary info on this topic, and the exciting movement happening in backyard gardens to protect the gorgeous, famous butterfly we call the Monarch. 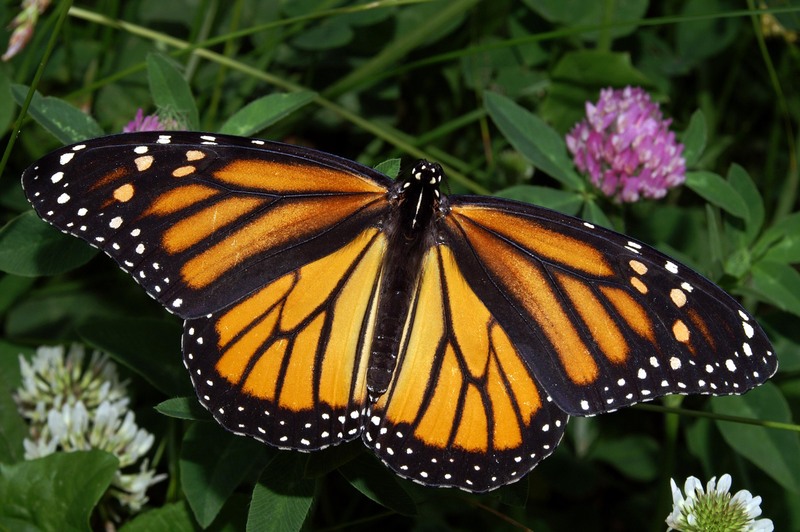 Female Monarch on clover, by Kenneth Harrelson on Wiki. Brrrr… are you guys ready for spring yet? We sure are! But since we still have a little longer in the cold, let’s celebrate more winter goodness. As you may have read in our last post about animal winter survival methods, there are two basic types of tools for getting through extreme weather: physiological adaptations, and behavioral adaptations. For the human animal, our physiological adaptations may not seem readily apparent, and our behavioral adaptations look more like “culture.” Read on to learn ten awesome (and relatively random) facts about how we walking apes adapted to survive colder temps! For life that must survive low temperatures and harsh weather in the Northern Hemisphere, there are three major routes to success. Each comes with its own advantages and disadvantages; a balance must be found between calorie intake and calorie expenditure. All groups of living things seem to use a good mix of each survival tactic, bringing their own special adaptations to the table. Read on for a quick look at how the Northern Hemisphere survives winter! The Great Backyard Bird Count is this month and you can participate! Sponsored by Audubon and Cornell, this is the GBBC’s 17th year. The event lasts four days, from Feb 14 to Feb 17, so mark your calendar now and sign up here, at birdsource.org. Counting birds is not only fun, but helps bird scientists know where the birds are and how many there may be. So go on, count you some birds. Click here or on the image to register! This is my first real autumn in six whole years! After living in the shadows of mountains and being surrounded by striking sagebrush oceans, I’m back on the East Coast and remembering the autumns of my childhood. They come much more slowly here, giving you the chance to breathe in the colors and textures of changing leaves and landscapes. Have you noticed how different the angle of the light is during autumn and spring? After the blazing and endless sun of summer, it’s so spectacular to me how the light comes in more steeply, sifting through branches and brightening things with a cool fire. This story is both amazing and inspiring – an enormous stick-insect, considered extinct since the 1960s, has a fascinating story of re-discovery and hope for the future. Read the story by NPR writer Robert Krulwich HERE or click on the image of the INSANELY GIGANTOR insects to read! !